Don’t let the name confuse you. This incredible national forest is located adjacent to Mt. Rainier National Park, on its north side. The national forest is a haven for recreationalists. Venture out on horseback, mountain bike or trek on foot along over 220 miles of trails – and yes, Fido can come along! In the winter months, the national forest is a winter wonderland with opportunities for snowplay, snowshoeing, cross-country skiing and snowmobiling. The Crystal Mountain ski area is also located on national forest land. 125,000 acres of land make up the Mt. Baker Snoqualmie National Forest that borders the north side of Mt. Rainier National Park. It includes both the Clearwater Wilderness area and the Norse Peak Wilderness area. Within the forest, glacier covered peaks feed the White River basin, while mountain meadows offer stunning summer wildflower displays to impress world-class photographers. Old growth forests give way to sub alpine forests along the ridges. And oh the views… Simply spectacular — especially near Suntop Lookout where manned fire lookout attendants still keep a watchful eye for storm-related events. The famous Pacific Crest Trail passes through the area making it possible to connect the dots with hikes from Mexico to Canada through the Cascade Mountain Range. In order to protect wilderness resources and provide a quality outdoor experience, the Mt. Baker Snoqualmie Ranger District offers information and regulations for the benefit of future generations. Their mission is to protect federal forest resources for the benefit of American people. Passes, permits, maps, and support are offered at the Ranger Station in Enumclaw. The national forest is open year-round, although certain roads may be closed during winter months. There are so many hikes in the national forest that you could literally hike a different trail almost every day of the year. Some of our favorites include Greenwater Lakes, Palisades, Snoquera Falls, Goat Falls, Rainier View, Sheep Lake, Henskin Lake and Noble Knob — but we could go on and on. The Silver Creek Visitor Center, just outside the northeast entrance to Mt. Rainier National Park on Highway 410, is a great resource and is usually open from Memorial Day through mid-September. 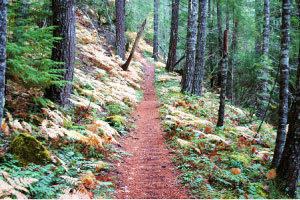 The District Office in Enumclaw also sells a great guidebook with information about national forest trails.